I've been thinking about Rudolf. 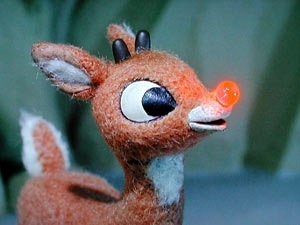 You know, the red-nosed reindeer. I've heard the song a time or two this holiday season. It's popular amongst the kindergarten crowd. And the crowd that idolizes kindergartners and copies everything they do. Anywho...I've been hearing this song which in turn makes me think about this song. And one thought led to another and...I'm thinking that's it's not so great. I mean, Rudolf was a complete outcast until Santa needed him for the foggy night. Then, all of the sudden, everyone wanted to be his very best friend. Just because he saved the night for the Big Guy and was suddenly super popular. It kind of mimics life, in a way. People who previously didn't give you a second glance all of the sudden want to be your bestie for one reason or another. But that "friendship" is fleeting. Which begs the question be asked....once the fog cleared, did they still let Rudolf join in all the reindeer games? Definitely. So they could judge him. Thank you for putting into words what has always bothered me with that song/story. Way to use a guy for his red nose. I'm hoping they realized the errors of their ways and begged his forgiveness...but who the heck knows?